Just in time for New Year's Eve, I present to you my favorite shimmer products from drugstore brands. I don't generally do the whole disco ball makeup thing, but a well placed glow here and there can really add a certain pop to your face. Maybe just don't wear all of these at once, okay? 1. Milani Baked Blush in Rose D'Oro: This blush is the absolute best. Great peachy pink shade with built-in shimmer that lasts all day. Holy grail status. 2. Revlon Balm Stain in Crush: A great shiny berry shade that seriously lasts all day. It moisturizes, smells of peppermint, and gets better the longer you wear it. 3. NYX Jumbo Eye Pencil in Cottage Cheese: Perfect for an inner eye or brow bone highlight. The pencil shape makes for easy application with a nearly blinding shine. 4. Sonia Kashuk Highlighter Stick in Sparkling Sands: A close dupe for Benefit's Watt's Up! Great shine and formula. Apply with fingers or a stippling brush. 5. Maybelline Color Tattoo in Bad to the Bronze: I cannot adequately express my love for Color Tattoos. TRY THEM, OK? A great neutral shimmery shade that would look good on anyone. 6. Wet n Wild Fergie Shimmer Palette in Rose Champagne Glow: Swirl these shades together for a wonderful sparkle on your cheekbones. Smooth, shiny formula. 7. ELF Shimmering Facial Whip in Lilac Petal: For that serious summer glow, dot this in a "C" shape on your temple and blend. It looks like liquid metal and cost $1.00! 8. NYX Roll On Eye Shimmer in Walnut and Chestnut: Beautiful shimmers to wear alone or together. Great for highlighting the middle of your eyelid. Rolls out smoothly every time. 9. Milani Bella Eyes Gel Powder Eye Shadow in Bella Emerald: Love these shimmery shadows! They're like butter and blend just as well. Emerald is rich and nice for dark eyes. 10. Wet n Wild Eye Shadow Trio in Silent Treatment: Great for a soft look or a more dramatic glistening eye (the light shade is a nice highlight). Soft, blend-able formula. What are your favorite shimmery products? What does your ideal New Year's Eve makeup look like? Great roundup of shimmer products! I would also like to recommend NYX's 'Born to Glow' illuminator - they're the perfect amount of shimmer without being over-the top! This is a really great post! I'm still trying to figure out how to make my makeup more special for tonight. I'm definitely thinking SOMETHING shimmery! "Cottage Cheese"? Seriously? I usually imagine naming shades of makeup to be a fun-filled, light hearted, pun-tastic job but "Cottage Cheese" seems to be the rare misstep. Regardless, I'm glad you included the color swatches on your arm lady. Very shimmery, indeed. Silent Treatment is one of my FAVORITE cheap eyeshadow palettes, mainly because of the taupe-ish color. It's amazingly good for the price. This is the second time I've seen Cottage Cheese recently and thought "I need that!" so I guess... I need that! I've been wanting to try that baked blush!! Love this post girly! 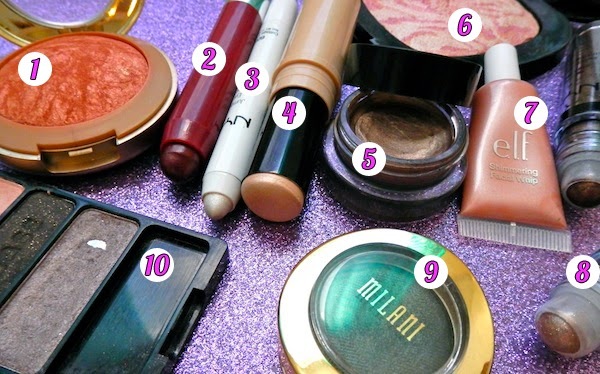 I actually have the Milani eye shadow you mention here. I love all their eye shadows. Pretty colors and good coverage. Oh this post came at a great time, because I was thinking for this spring I wanted to up my shimmer game and have my everyday make up look have more of a glow. I love Milani products, so I'll probably try that one first. Do you use anything for body shimmer? I've been wanting to have more of a glow on my legs and arms and looked at NARS body glow, but it's kind of expensive. I need to try some of these out! I have no idea ever where to start with beauty products! So pretty! I'm loving the shimmery smoky eye! I hope you're having a wonderful new year! These all look so pretty - def want to try that Elf liquid! You look absolutely STUNNING in those #selfies dahhling! I love the two-tone hair! I hope to one day get a similar effect. What is that base/darker color? Is that still the one your worked on when you wrote about toning your hair a little while back? Anyway, sorry, back to the post; I love the look of cottage cheese from NYX (except that name kind of made me cringe, can't lie hahah). Thanks so much for sharing these awesome drugstore picks!! I will be on the look out! I am no good at applying makeup. I need to take some serious lessons from you. Ahh!..The Milani blus Rose dóro is gorgeous!! Love how you reviewed these affordable and accessible products! These blushes look incredible! I love them! Great products, can you recommend me a lip balm or gloss with a good taste? I've tried so many brands but all of them are so awful in taste.